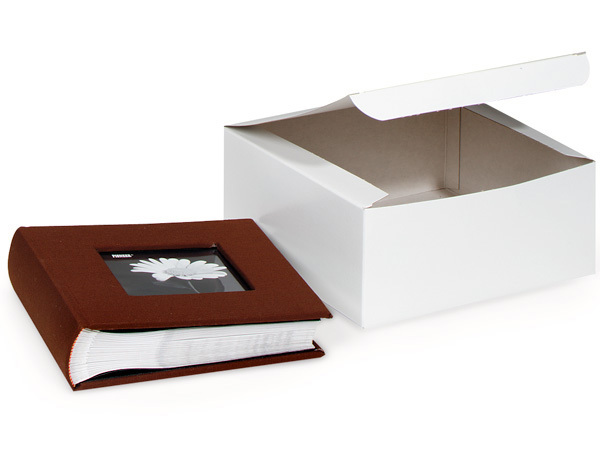 100 Pk 8x8x3.5" 100% Recycled White Gloss Gift Boxes with light gray or white interiors, 1-piece fast semi-automatic. Green Way ® Eco-Friendly Packaging. Yes! We can print it! Personalize your boxes with a company name and/or logo. Call our Custom Print Department at (800) 547-9727 ext. 4 for details. You can buy a cheaper box, but not a better one! Interiors will vary from light gray to kraft. Available in 1 pc and 2 pc sizes. 1-piece boxes have a double lock bottom with a tuck top lid. 2-piece boxes have telescoping lids to expandable for best fit!